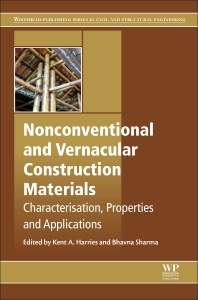 Nonconventional and Vernacular Construction Materials: Characterisation, Properties and Applications provides a comprehensive repository of information on materials science and the modern structural engineering application of ancient, vernacular, and nonconventional building materials, with leading experts contributing chapters that focus on current applications and the engineering of these construction materials. Opening with a historic retrospective of nonconventional materials, Part One includes a review of vernacular construction and a discussion of the future directions for nonconventional and vernacular materials research and applications. Chapters in Part Two focus on natural fibers, including their application in cementitious composites, non-cementitious composites, and strawbale construction. In Part Three, chapters cover the use of industrial by-products and natural ashes in cement mortar and concrete, and construction using soil-cement blocks, clay-based materials, adobe and earthen materials, and ancient stone masonry. Timber, bamboo, and paper construction materials are investigated in the final section of the book. Kent Harries is an Associate Professor of Structural Engineering and Mechanics at the University of Pittsburgh, USA. His research focuses on fibre-reinforced polymer (FRP) materials and – over the last five years – full-culm bamboo and the characterization of bamboo materials. He the author of over 220 peer-reviewed technical articles, and is Editor of the Journal of Construction and Building Materials and FRP International. He is an Associate Editor of the ASCE Journal of Bridge Engineering. Bhavna Sharma is a Senior Research Associate in the Department of Architecture at the University of Cambridge, UK. Her research focuses on the use of natural fibre-reinforced composites and the properties of full-culm and engineered bamboo as an alternative construction material.